Australia is a very welcoming and diverse country which is famous for its population of kangaroos among other unique species of animals like emu, koalas or vegetation like the eucalyptus. Close relatives of kangaroos are the wallabies, named after an aboriginal tribe. Many tourists visit Australia just to see them in their natural habitat and are amazed by their adaptability skills. They have transformed their bodies over the years to fit better in such dry environment. Their story is a truly important lesson on survival. As other species found only in Australia, kangaroos and wallabies are protected by law. 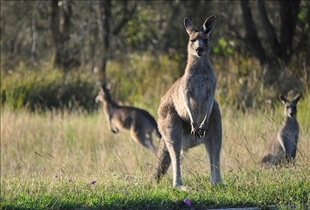 Kangaroos populations can usually be found around areas where grass, bushes are abundant, in forest glades, on the coasts covered with heath and arid areas too. Their body allows them to fit in different environments and hopping helps a lot to cross the dessert plains of Australia. The wallaby is a resident of remote areas in Australia. This animal is suited to warm climate, but not extreme dry environments. The wallaby was introduced as a species in New Zealand too and some parts of the world like the islands of Hawaii. 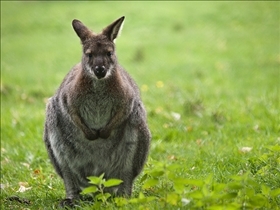 A kangaroo can be up to 2 meters tall (6.7 ft) and weigh up to 90 kg (200 lbs). These features usually apply to the red kangaroo – the biggest of the 4 species. A wallaby has a smaller size of up to 1, 78 m (5.8 feet) - tail included. Its weight doesn't surpass 24 kg (53 lbs). There are a few threats for the kangaroo population. Eagles can attack kangaroos as reports have mentioned. Some species which have been introduced in Australia can raise concern too. It’s the case for foxes or dingoes. Kangaroos have developed defense and counter attack skills to face such issues. They mostly use their strong feet. The wallaby has the following natural predators: dingoes and eagles. They can hold resistance to attacks especially because they are fast and their small size helps them to hide easily too. Kangaroos can live in different habitats from extreme dry ones to areas covered with bushes and grass. Wallabies prefer warm climates but cannot withstand in arid areas. While kangaroos can grow to be 6.7 ft. tall, wallabies can reach as adults up to 5.8 ft. only, but there species even smaller. Main predators include dingoes and eagles for both the kangaroo and the wallaby. The Red Kangaroo is an expert of living in the dessert. The Eastern Grey Kangaroo can be found in more fertile lands on the eastern side of Australia. The Western Grey Kangaroo inhabits the western coast of Australia, but also the region crossed by the Darling River. The Antilopine Kangaroo populates the northern woodlands. Which Aussie critter has a better disposition?